This image was making the rounds on Twitter last week, it looks like it was first Twitted by Bike Blog NYC. 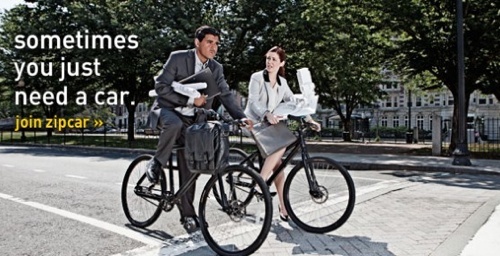 As you can see, the ad depicts a couple of business people very inefficiently carrying a bunch of crap whilst riding bikes in business attire. Their problems could easily be solved by a good messenger bag or some saddle bags on their bikes. They don’t actually need cars. Yes, the whole point of Zipcar is that indeed, sometimes you might actually need a car. It is great that this company exists for those of us who choose not to own cars. However, implying that it is simply impossible to get to your office without a car is not a message that us car free individuals repsond too. 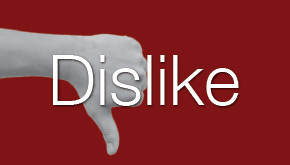 People who feel that way own cars and are not Zipcar’s target audience. 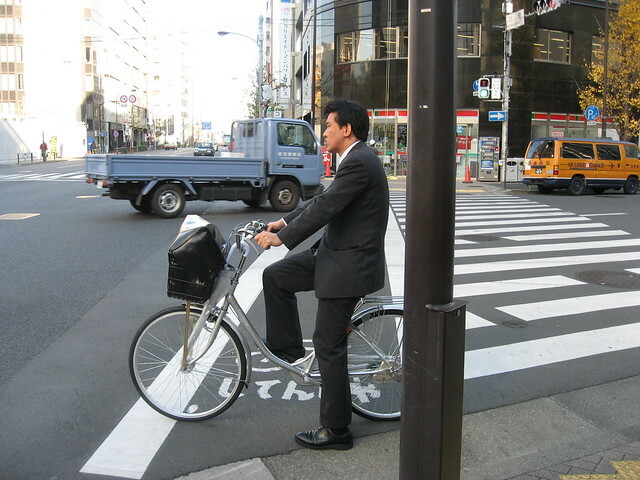 It is actually quite possible for a business person to get to their office on their bike, without need for a car. Ironic given that many of the people key to the establishment of Zipcar were/are active bike advocates. In fact, one of them is now the general manager of Hubway, Boston’s brand-new bike share system. Also, Gabe Klein who brought bike sharing to DC and is now busily laying bike lanes and cycle tracks all over Chicago for Mayor Emanuel was an executive at Zipcar when they started going national. I’m a big proponent of Zipcar, but I’m stunned by how tone-deaf that ad is and dismayed by the gratuitous potshot at cyclists. I’ve decided that when I do buy a car I will keep my zipcar account too. Why? Because they are in my favorite cities and I can just book and go. For example, I’m not going to drive into NYC. I’d rather take the train or bus. But to be able to get a zipcar there makes it much better. Whether using a car is morally right isn’t the point here. This is an ad for a car service. Why on earth, if you’re promoting a car service, would you encourage people not to use a car? Either way, I’m willing to bet that there are plenty of bicyclists out there who can relate to the task of schlepping somewhere with some big dumb object, and wishing it were easier. It is so tone-deaf though. Those people don’t need a car. Someone commented on Facebook that it would be more effective (and more factual) to show someone on a bike trying to move a couch or something. Certainly there are tasks that can’t be accomplished on bike or on foot or on transit, and those of us without cars can either choose not to do those things, or utilize a service like Zipcar. Their advertising would be more effective to us if they showed actual need, not insulting us by assuming we couldn’t possibly figure out how to get to work without them. Plus, the way Zipcar scheduling and fees and mileage work, you would never use it to commute. Zipcar cannot actually address these peoples’ needs if we’re to assume that they are commuting to work, which it appears they are doing.